In the earliest days, I struggled with assigning any type of numerical rating in a cigar review. I made a couple of feeble attempts, but soon settled on written reviews that simply described my personal experience smoking a particular blend. After the first couple of years, it became apparent that “something” was missing from my reviews, so I began to hone my method into what it has become at present. I still have some reservations about providing numbers as a sole indicator of a cigar’s quality; I don’t believe a simple number can tell the whole story. A designation of “90” may rarely be given by one reviewer, and require a near life-changing experience. For another, “90” is a baseline, for “passable” or better cigars. The same experience for the two reviewers may result in wildly varying numerical ranking. By the same token, a standalone written description to a reader unfamiliar with the reviewer offers little guidance. A “go/no go” gauge or degree of likelihood of purchasing a particular quantity of the cigar leaves much to be desired as well. Deciphering the intent behind a written summary can be difficult for readers unfamiliar with the reviewer’s history, possible bias and tastes. With that in mind, I originally constructed the current review architecture for use on The Cigarmy (and now Half Ashed). Going forward, my reviews will have two distinct segments: written content and a numerical rating. Written content will continue to be as complete a description of my experience with the cigar as is necessary to convey its quality in terms of appearance, construction, flavor and value. 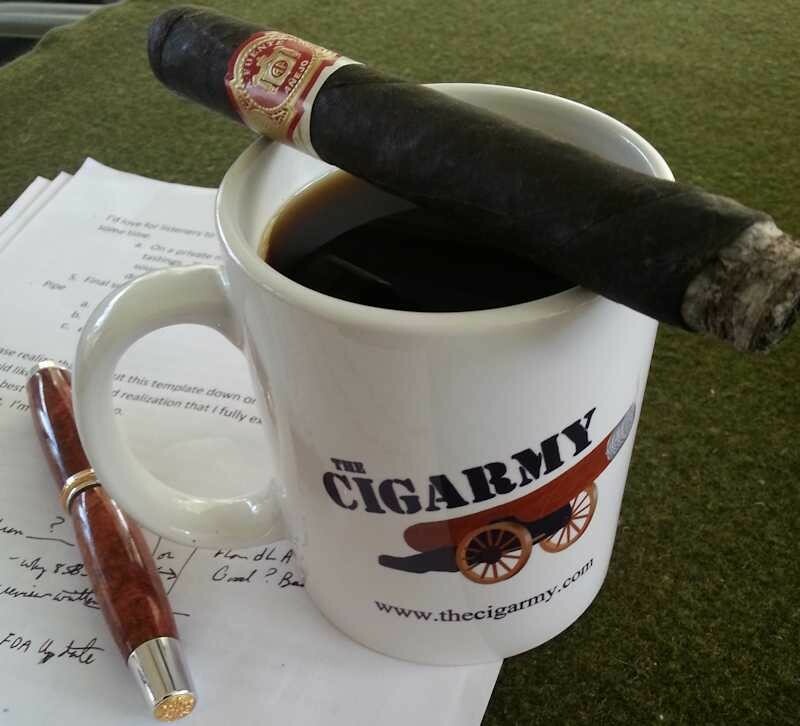 Typical written reviews on Half Ashed run anywhere from 800 – 1200 words in length, and may be a compilation of multiple cigars smoked in preparation for the review. Unless otherwise noted, a minimum of 2 cigars are smoked for each review. I also include any other pertinent details about the company behind the cigar, blend history, origin or packaging, availability, and pricing. The focus of the written portion of a review is to describe the experience, and note any standout features of a cigar – good or bad. Readers are welcome to leave comments about their experience with this cigar, or any questions that may arise when reading. Cigars begin with a possible 100 points in every category. During each judgment interval, the cigar is assessed and deductions given (based on the “Minutiae” tab). The average of these deductions is subtracted from the original 100 points to reach a component score in each category1. These component scores are then averaged to produce the final score for the cigar. 1The only variable in this formula is for the “Flavor” category. As outlined on the “Scoring Categories” tab, my personal, subjective understanding of what represents a pleasant flavor accounts for one-third of the component score. Therefore, the more objective interpretation of a flavor score will be weighted doubly to account for two-thirds of the end result. All other components follow the math as outlined. The Construction rating is based on a number of factors. These may include density of pack and draw resistance, wrapper/cap placement, or even minor presentation details. Most of these are observable before lighting, but may be encountered during the cigar. Plugged cigars, or those with extremely tight draw, are simply discarded if they cannot be made acceptable. In this case, another example would be smoked and the initial plug noted in the review. The degree of the deductions received will come down to whether a noted defect is merely observable, or has a real impact on the practical. Aesthetic imperfections will garner -5 or less in deductions, while core construction items (pack, head construction, wrapper application, etc.) will have greater bearing. In my review philosophy, construction issues will have greater bearing on the final score because they are an integral part of the smoking experience. This category also lends itself well to being measured at only two intervals: one prelight and one throughout the duration of the cigar. Like construction, the burn rating can be impacted by a number of factors. Burn intensity – So hot the flavors are impacted, and cannot be controlled by smoking cadence? So slow it continually goes out with regular puffs? An inconsistent burn line – Slight touchups will be expected on occasion, but canoeing, tunneling, or extreme pencil-points will more seriously impact the score. The degree of deduction depends on severity and impact on the smoking experience. A meandering burnline would, in most instance, call for a minor deduction of 2.5 – 5 points. Canoeing, or serious tunneling issues would be a more serious (7.5 – 10pt) deduction. This is the most difficult of all factors, due to sheer subjectivity. My attempt here is not simply to produce a score based on my appreciation of a given flavor. This rating will be most impacted by a lack of flavor or presence of clearly “off” or foul flavors. Descriptions of my specific perception of flavors will be detailed in the written portion of each review. As for scoring, the flavor score will have two components, of varying weight. My personal understanding of a pleasant flavor (total subjectivity) will count for one third of the final score. A measurable lack of or presence of foul flavors will count for the other two thirds. The word balance, in reference to cigars, is understood in a few different ways. My understanding, and goal with this factor, is to communicate how well the body (“mouthfeel”, or impact on the palate and mucosa), flavor qualities, and strength inter-relate within the blend. For example: A cigar that is “out of balance” would be mildly flavorful but overwhelmingly intense with nicotine. There is some subjectivity in the perception of these three, but I believe most readers will be on the same page in understanding this delicate interplay. Is it a very good cigar, but outrageously expensive? Out of the reach of most consumers? There’s likely to be some eyebrows raised, but I’m including this in the rating. Generally, my philosophy is that most quality premium cigars fall within the industry “sweetspot” of approximately $6.50-$9.50 each. Now does that mean a $20 cigar will never score well here? Absolutely not….if it delivers a $20 experience. A $12, $15, or even $20 cigar can certainly score exceptionally well if it delivers. The “sweet spot” is merely a guideline, but anything that is considerably above that will be scrutinized. However, cigars below that pricepoint will not necessarily score better simply for that reason. It must still be deserving. This rating is relative to current market conditions, but at current I am setting the “norm” at $8.50 per cigar based on local (Tampa, FL) conditions. This will evolve as market pricing inches up. This is a tough category to explain – hence the name. It will not always be in place, and is an outlet for the exceedingly rare instance that I believe a cigar simply deserves a point or so better…or worse…than it has received. It’s a way to temper the weight of the overall score should that happen. You will see this category listed if it has been used in the final score, and its standalone influence will be published in the review. This spawns from that feeling down deep in the gut that justice has not been served. This category will rarely be used. Silliness? Maybe. But, it’s my site and I’m 100% transparent on how it’s operated. 10 pt+ deductions: Serious flaws, although a “10” is not a review-ending issue due to the compounding nature of the review architecture. Serious unraveling, unrecoverable burn issues, etc. can even draw a deduction greater than 10 points, but if the cigar is salvageable the review continues. There is one area in which a 10+ point deduction will have a lesser impact than would seem at first blush: In the category of Value, deductions of greater than 10 points may be given for a cigar, even if it performs well – based on its pricing distance from established industry “sweet spot.” Negative deductive points may also be awarded to improve the score of an above-average performing cigar that is priced significantly below this high-water mark. 70 or below Poor cigars, likely in many respects or with many issues. This can be due to consistently botched construction, “off” flavors as a default, wildly off-balance blends, or any combination therein. Not recommended. Any cigar that falls below a 65 score will not likely have a completed review published….but just might be mentioned on the podcast or forum. 71 – 78 This range of scores will encompass those cigars that are “passable” – but in all likelihood inconsistent. The fact of the matter is, you might find a hidden gem in this group….but not with any frequency. Expect some major flaws or problems, either in consistency of primary flavors or build. 79 – 86 Cigars in this category will be good performers. They will not likely display any superlative characteristics, but won’t be excessively flawed. I expect this category to be filled with consistently good cigars that may not stand out as especially remarkable or noteworthy – yet offer an enjoyable smoking experience nonetheless. All that being said, I would at least recommend grabbing a single to try. Depending on personal preferences in taste, one could find a definite winner here. 87 – 93 Excellent cigars, without a doubt. These are cigars that are quite well rounded, and score exceptionally well in all categories. Minor burn issues may have arisen, or some other small mis-step, but overall they are very good performers. These are absolutely worth checking out, and probably worth a box purchase for the majority of smokers who enjoy the hobby enough to buy by the box. 94 – 99 The “Best of the Best,” short of a perfect score. These are phenomenal cigars that stand head and shoulders above the majority of their peers. In this group, the quality of the experience goes up greatly from point-to-point. The difference between a “96” and a “97” is much larger than that between “86” and “87,” for example. The air is thin up here, but there are some who breach this category. 100 A truly superlative cigar in every respect, from the moment it’s brought to eye until the last wisp of smoke dissipates. There’s every chance this rating may never be awarded in a Half Ashed review. It is certainly possible for a cigar to achieve it, but in 20 years of smoking, I don’t know that it’s ever happened for me. Of course, every cigar has a 100 rating before you remove it from the box…..
Want to have your own blank to work with so you can reach your own conclusions about a given cigar? Just download the either of the files below and have at it! Right now, this is the most basic “just to get started” file possible. It’s in Microsoft Excel format; if you have another preference, let me know and I’ll see what I can do. The first (SIMPLE) file is if you just want to see the math at work. The second (COMPLEX) is slightly more polished, and suitable to print out if you’d like a record of your assessments. NOTE: To download these files, first click the appropriate button. After it has opened in a new tab, simply click “Download” toward the upper right hand corner of the displayed file. With regard to samples furnished by retailers, reps, or of other origin: I will always disclose how the cigars under review came into my possession. The majority of cigars reviewed are purchased by me at local brick & mortar shops in my travels. Samples are accepted but never requested, always disclosed, and have no bearing on the result of review. To date, we have not accepted any sort of advertising on Half Ashed. All requests have been respectfully declined. Again, this website is simply a hobby for us, and grows out of our love for the industry and sharing its products with others. Any links or recommendations are solely motivated by our personal experiences and customer satisfaction with retailers or manufacturers. No compensation of any kind has been exchanged for exposure on the site. Readers can contribute to reviews here in a few different ways. Comments can be left at the end of each article or review, which will be publicly visible. An account is not necessary for commenting, although spam-fighting verification is in place. Secondly, readers are able to leave an overall rating for the numerical portion of a review. Simply mark your personal score on the included “Reader Rating” bar and click it. The Reader score shown will be an average of all scores that have been contributed – but will not impact my rating, which will be maintained separately. If you’d like to keep your own record of how you’ve rated cigars, visit the “Download Test Grid” tab and download one of the files – either a simple grid (no fluff) or the other, more polished grid that looks a bit better for printing. Finally, I will offer this up here….if you want to create your own fullblown written and scored review, I encourage you to visit the forum and join up, where you may post your own review of any cigar. Simply create a profile and have at it!